I have around one hundred 18 year olds pass through my classroom doors each year. I consider it an honor that some confide in me their life stories. There are many superficial commonalities to what I hear in “I love this…I hate that” teenage jargon. However, the struggle of adolescence usually includes a few main threads: “My parents don’t understand me, I want to be accepted by my peers, I’m nervous about what the future holds.” Even teaching in China, the themes of teenage struggle hold constant with my students there. With an at risk population such as residents at a refugee camp, there is a whole new and much more heart-breaking perspective: “My parents couldn’t afford to flee the country with me, my friends were killed by mortar fire, and I have no clue what tomorrow holds.” While not everyone has experienced those exact situations, they are some of the unfortunate fixations that are all too common amongst displaced persons. Hearing snippets of stories like that from the mouths of people who lived them is not just enough to make me forget about my trivial daily complaints like not having wifi or a washing machine, but to actually feel guilty I ever considered such small things real issues in the first place. I quickly made friends with an 18 year old boy in camp named Hassam because desperately, yet understandably so, he was seeking to connect with anyone he could as he arrived the same day I did. I arrived via ferry from Athens where I had taken in cultural relics of an ancient civilization for a couple days and stayed in a hostel that overlooked the midnight glow of the Acropolis. Hassam arrived via a small rubber boat from the coast of Turkey where he had spent two nights sleeping out in the open on the forest floor, trying to evade authorities while carrying just a handful of personal belongings. Hassam taking a selfie in the Turkish wilderness with other people who would share the same boat on their journey to Greece. Photo courtesy of Hassam. Hassam was born and raised in Baghdad, Iraq, a city you may recognize only from the maps and night vision images of bombs streaking across it’s skyline that were broadcast when the US initiated its search for Weapons of Mass Destruction. Hassam made it clear that America had thoroughly “fucked up” his country and while he doesn’t like the United States as a country, holds no ill-will towards me as a person, unlike a few other camp residents who do. What was also crystal clear was how the country became destabilized and a hotbed of radical forces once US forces started to pullout. When describing why he was compelled to leave Iraq, Hassam offered generalities. “For many reasons; we have a miserable life. Iraq has no future.” I know enough not to pry into past trauma and in time he will share what he is comfortable sharing as we build more trust together, but he did elaborate more to say he is Sunni and was receiving Shiite and ISIS threats on two different fronts. That fear and ever looming danger just became too much to take. After two days of what Hassam describes as government orchestrated attacks on citizens, including explosions at a mall that killed hundreds, he decided it was time. He echoed an assertion I had heard many times before: that everyone is so aggressive and angry because of how hot it is. At first hearing this, I thought of how tired I was working in the hotbox of a gravel-grounded camp under the cloudless Greek sky as I sipped my ice water and wiped the sweat from my brow. As Hassam showed me his sleeve tan-line, the difference between night and day, I looked up to see the current temperature as a mild 32 C when he told me August in Iraq gets up to 55 C. Naturally, I asked about air conditioning, to which he said that the government electricity quickly gets overloaded from such heavy usage, and then the much inferior city electricity will kick on as backup before everything just goes out. All in all, he says Baghdad got about two hours of electricity per day and then everyone just sat around being “hot and angry” the rest of the time. While the environment at Kara Tepe might provide a cooler climate, the heat of uncertainty still courses through him. From Baghdad, he travelled to the north of Iraq to get a visa and flight to Istanbul. There, he stayed in a hotel for two nights waiting until his smuggler decided it was time to move. One morning at 3am when the police presence was apparently thin, the smuggler arrived and led them him and others comprising a group of 35 on a two day trek through the Turkish forest. They slept outside without blankets, mats, or tents, just huddled with each other and a final shred of hope. At 3am again, they awoke to begin their 3 ½ hour journey across this straight of the Aegean to arrive in Lesvos. 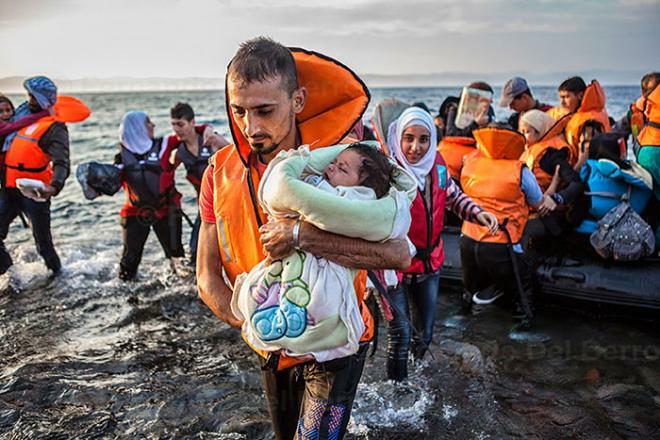 Among the 35 people crowding this small rubber dinghy, were two pregnant females. Hassam’s cousin and his family who he now lives with in camp were seated in front of him, and other displaced persons, some from Africa were seated in back of him. The boat driver was from Iran and would also be seeking refuge in Europe. He was the only one who did not have to pay for the crossing, as technically he was in charge of getting everyone across. Although due to smugglers trying to make as much money as they can off the process, a cheap motor was used that cut out twice in darkness of the oversea journey. “For me, I was scared. I didn’t have a safety suit,” recounted Hassam as he also added that he didn’t know how to swim. While everyone pays a different price to cross, Hassam was charged $1,000. A Syrian woman from Pakistan who made the same crossing from Turkey was charged $5,000 by her smuggler who then disappeared. Her and her mother then found another smuggler who they gave all of their possessions to, including gold jewelry, clothing, and electronics, in exchange for the voyage. He too disappeared. They were in Turkey for a whole year before they actually made the trek after finding a third smuggler who was miraculously from their town in Syria and had a sense of loyalty through common ties. He charged $2,000, the accrual of which must have been what took so long in Turkey after having traded everything prior. In a windy region that has a shocking saltwater swell, I was not surprised to hear how much the boat rocked back and forth as it made a zigzagged approach to the shoreline visible in the glow of sunrise. As the boat was spotted, a helicopter hovered overhead to notify the shore crews and standby for emergencies. Very often, these cheap and overcapacity boats capsize or take on water and sink. While actually typing this piece, I received a notification that a wooden boat leaving Turkey for Lesvos at 1am capsized 45 minutes after disembarking due to high waves. One family with two kids died, 4 people were hospitalized, and three men are still missing. Only 2 had life vests. Thousands have died in the journey to Lesvos in less than a year. Upon arriving, the boats are met with volunteers on shore who provide foil blankets and changes of clothes if needed to prevent hypothermia. A bus is usually waiting that takes them from the landing point (if the typical closest point of land in the Molyvos, northern Lesvos) an hour south to be processed in Moria camp in Mytilene, which is a closed camp run by the military. If the situation dictates it, new arrivals can move to Kara Tepe camp down the street where I work. I’m still trying to figure out what “if the situation dictates” actually means, but I know families have first priority for coming to the much preferred and open camp of Kara Tepe. Hassam knows he has been extremely lucky to get to this point and as his journey onward will no doubt be trying, he appears to be approaching each day with a great sense of hope and mental fortitude. Like most residents of Kara Tepe, he actually enjoys living in the camp with a good community feel and several services offered to residents. However, this will not stop him from trying to get to Germany, the most desired end point for displaced persons. After Angela Merkel announced what many considered a “refugee friendly, open door policy”, word of mouth spread quickly that Germany was the friendly, accepting, gold-standard of asylum. While borders have since been closed, these rumors still persist and because many people’s family members got in before the new iron curtain dropped, it remains the pie in the sky final destination.